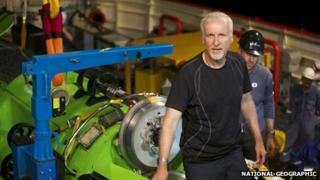 He has just successfully completed a test-dive 8km (five miles) down off the coast of Papua New Guinea. He now hopes to reach the world's deepest point in his one-man submersible in the coming weeks. Only two people have been to the bottom of the Mariana Trench, back in 1960. Mr Cameron said: "The deep trenches are the last unexplored frontier on our planet, with scientific riches enough to fill 100 years of exploration." The director has long been passionate about the oceans, and used submersibles while working on Titanic to film the wreck of the doomed liner deep underwater. Mr Cameron's sub is called the Deepsea Challenge, and was built by an Australian team of engineers. It fits just one person, which will be the director himself. It is kitted out with cameras, including a small stereoscopic camera that can withstand the 1,000 atmospheres of pressure that are found 11km beneath the waves. Mr Cameron said that he plans to spend six hours exploring the bottom of the trench, and would be gathering footage for a 3D documentary based on the dive. He will also be collecting samples for the scientific community. He said: "Our goal is to build a scientific legacy for generations to come. "It's also to inspire people across the globe to celebrate exploration and to explore with us online and through the media we produce." The expedition is backed by National Geographic and Rolex. If his dive is successful, Mr Cameron will be the first of four high-profile contenders who are attempting to reach the deepest place in the ocean. Richard Branson's Virgin empire is backing another one-man submersible called the Deep Flight Challenger, while Eric Schmidt from Google has donated money to marine technology company DOER Marine to build another vessel. Florida-based company Triton Submarines plan to build a sub that can take adventure tourists down to the bottom of the ocean for $250,000 a ticket. The only people who have ever been to the Mariana Trench are Don Walsh, then a lieutenant in the US Navy, and Swiss oceanographer Jacques Piccard, who died in 2008. They made the dive in a vessel called the bathyscaphe Trieste on 23 January 1960. Captain Walsh told BBC News: "I take no pride in the fact that no one has gone back in more than a half Century. "At the time we did our dive, our best guess was that it would be about two years before scientists would be back into the trench. "So I am very pleased that Mr Cameron's team is about to do this." While no humans have been back, scientists have been able to explore the trench with landers and underwater robots. They say the deep sea is of increasing interest; there are more than 20 deep trenches around the world, although the Mariana Trench is the deepest. Biologists have been surprised at the range of life that lies in the deepest ocean, while geologists are interested in how trenches may affect earthquakes and climate change. Captain Walsh added: "Understanding the great trenches in the five oceans is essential to a greater understanding of how our planet works. "While much work can be done from surface ships, the use of manned and unmanned submersibles is vital to doing science where the depths range from 6,000-11,000 meters (20,000-36,000ft)."